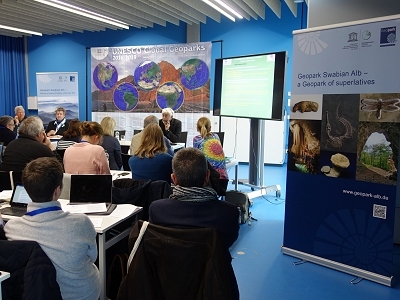 A big panel - with the Geoparks distribution in the World - welcomes participants at the second UNESCO Geoparks Evaluators Seminar held as part of the EGN meeting at the Swabian Alb UNESCO Global Geopark in Aalen, Germany. Presentation of the seminar which aims to share operational guidelines and consequently improve the homogeneity of evaluations/revaluations. The seminar is structured as a real refresher course; at the end of the day the participants will be evaluated by a multiple-choice test. 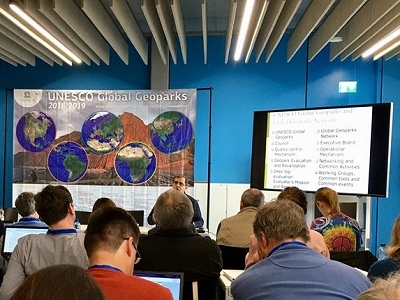 One of the most important interventions is that by Nickolaus Zouros, president of the Global Geoparks Network, concerning the new procedures for UNESCO geopark evaluators. 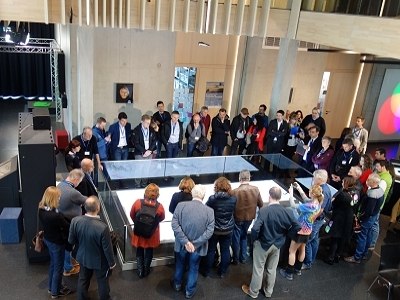 During a break, visit to the educational laboratory of the University of Aalen (Science Center) which hosts the seminar. Following that, Marie-Luise Frey specified the guidelines that the evaluators are required to follow during their evaluation missions. 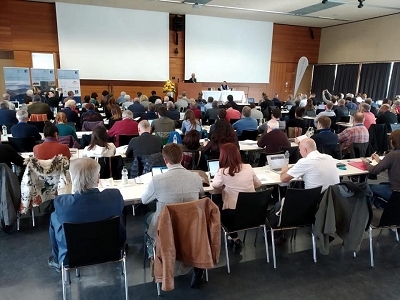 Works of the EGN meeting started with the greetings by the host geopark, the Swabian Alb UGGp, to the representatives of European geoparks. Another image of the conference room. Italian group is on the right. 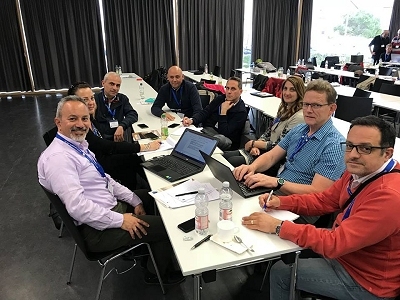 Babbis Fassoulas coordinates the activities of the working group on "Disaster Risk Reduction" that is becoming increasingly important in the European network of Geoparks. 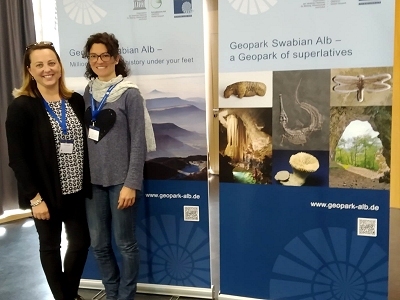 One of the mottos of the host Geopark is: Swabian Alb a Geopark of superlatives! 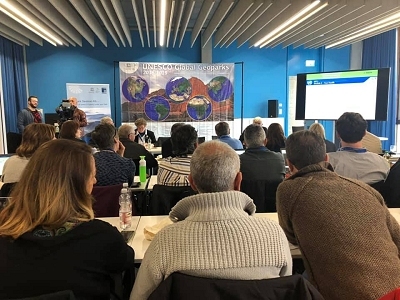 And two of the Italian representatives are also superlative, Alessia Amorfini and Violet Masè, respectively from the Apuan Alps and Adamello-Brenta Geoparks. 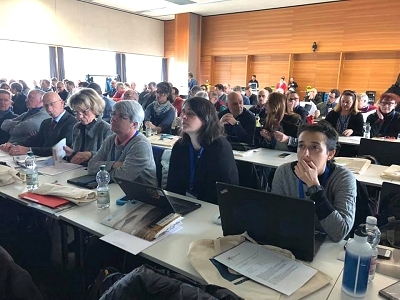 Today was also the day of the confirmation of Alessia Amorfini as a member of the Advisory Committee of the European network of Geoparks: congratulations! 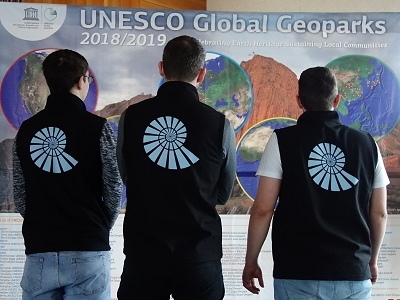 Day dedicated, among other things, to the now traditional Geofair, aimed at schools and the general public, aimed at promoting geopark territories and their UNESCO Global Geopark philosophy. 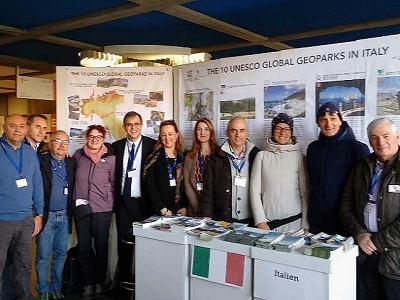 Nicholas Zouros with the Italian representatives in the stand booth dedicated to the 10 Italian Geoparks. 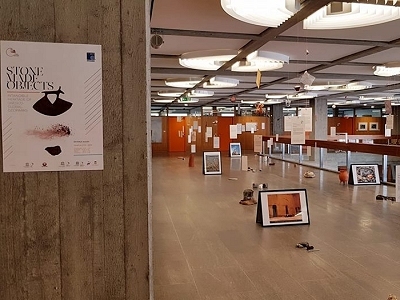 "Stone made Objects" is an exposition about the local geodiversity and its role in shaping local identity. Here, several European Geoparks present their geoproducts telling intangible stories of stone made objects. 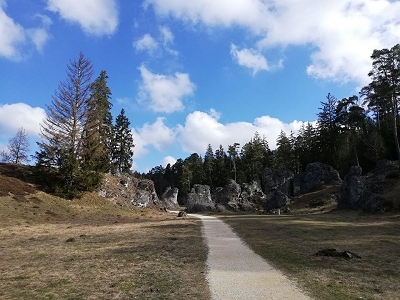 The last day of the 43rd Meeting is dedicated to the field trip in the Swabian Alb Geopark, visiting karst landscapes, paleontological sites and meteorite craters. 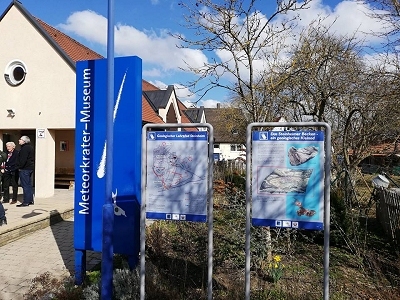 One of the the most important step of the field trip is the visit to the Meteorkrater Museum of Steinheim am Albuch. This area was shaken by the impact of two great meteorites 15 million years ago. The astronomical and geological event is explained clearly in the Museum. 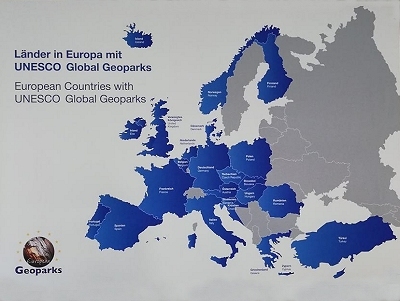 The last image is dedicated to the updated map of 24 European Countries including 73 UNESCO Global Geoparks.